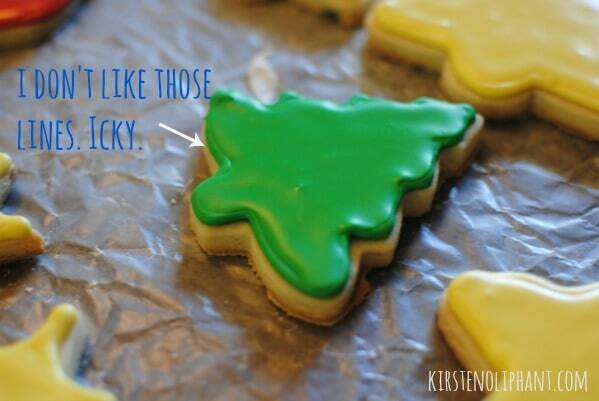 Recently I posted my favorite sugar cookie recipe. Now that I’ve made something like 400 cookies in the past two months, I thought I’d share a few tricks and tips for icing sugar cookies. These aren’t exhaustive and there are professional people who may talk about this better. But here are the methods I’ve found through years that work in my kitchen. First things first: if you don’t have the right icing, your sugar cookies won’t look as good and certainly won’t harden. You can check out my recipe, or find a royal icing recipe. It uses meringue powder, which is expensive but allows the icing to actually harden so you can transport them without a goopy mess. Without the meringue powder, they will harden to a degree, but not fully. Note that using an electric mixer is a must with royal icing because the meringue powder reacts to being beaten—it is, after all, made from egg whites. Every sugar cookie decorator has their favorite tools. Mine have adapted over the years, and I think I finally have a short list of what I use. I prefer the piping bags to the squirt bottles for several reasons. I always end up with too little or too much in the squirt bottle and it’s harder to squeeze it out without a lot of air coming out. If you find it easier to work with these, keep a glass handy and store them upside down as you work so that the icing stays down near the tip. Piping bags took some getting used to for me, but now that I have used them a lot, I like the control. I use rubber bands to close off the end of the bag tightly. 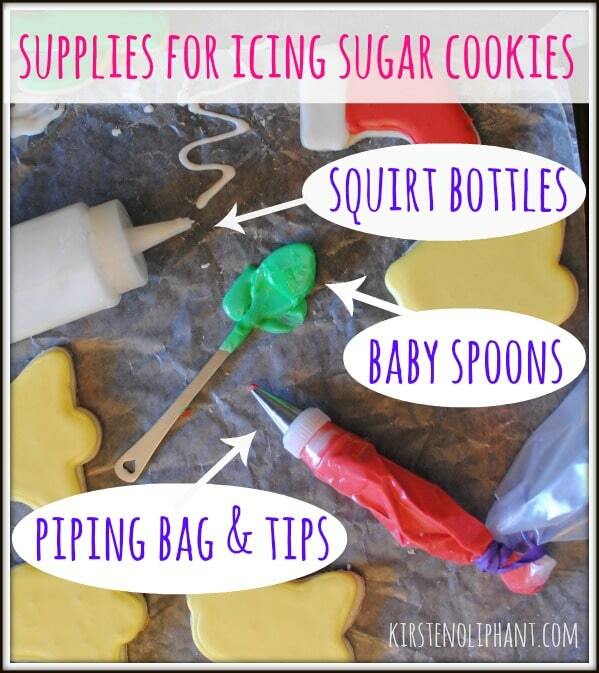 For years I would use a spoon or those cheap plastic kids’ paintbrushes to simple ice the cookies. I would start with a lot of icing in the middle and push it toward the edge, leaving a little room in case the icing ran a bit. It took a lot of convincing that adding the step of outlining or piping the edges was a good idea, but now I’m sold. You’ll probably want your icing a little thicker for the piping part, and so I always make my big batch THICK. I’ll separate a little into a bowl, color it what I want, then fill a piping bag with a little less than half of the thick icing. Using a drop of water at a time, I’ll add a little to the remaining icing in the bowl so it’s more fluid for the flooding stage. Then it’s simply a matter of tracing a line around the outside of the cookie with the thicker icing in the piping bag and filling it with the looser icing, using your baby spoon. -You really can’t have too much icing. Make sure you use enough as you work. This will result in a better taste and smoother looking finish. -When filling in the cookie after piping the edge, start with the middle and work your way out. This helps keep you from overfilling so that it runs over the edge. I still keep this flooding icing pretty thick, but just loose enough that it moves with you. Start with a bit of icing in the middle and push out, adding as you need to, but adding toward the center always.-Don’t let your spoon touch the cookie. What I mean is this: use a thick enough amount of icing that you’re just pushing it around on top of the cookie, not dragging icing over the top, which will leave you with a rough finish and maybe even some loose crumbs. -Many people let the piped edge fully dry before they flood. I personally like to pipe 1-3 cookies, then flood. This allows the edge to set up a bit, but not be so hard. I don’t like seeing the line at the edge of the cookie between the flooded and piped areas, so if the edges are still a bit wet you can sort of lightly work the inside icing into the edge as you go. This simply looks smoother and more polished to me. -I think simple is better, so I stick to using great colors, but not doing a lot of detail. My cookies will look great on display or in a bag, but they don’t individually have a lot of detail. I like to work fast, and detail just means I slow down. I’m also not great at those little decorating details and it takes TIME. So unless you like that and have tons of time, stick to doing simple and doing it WELL. 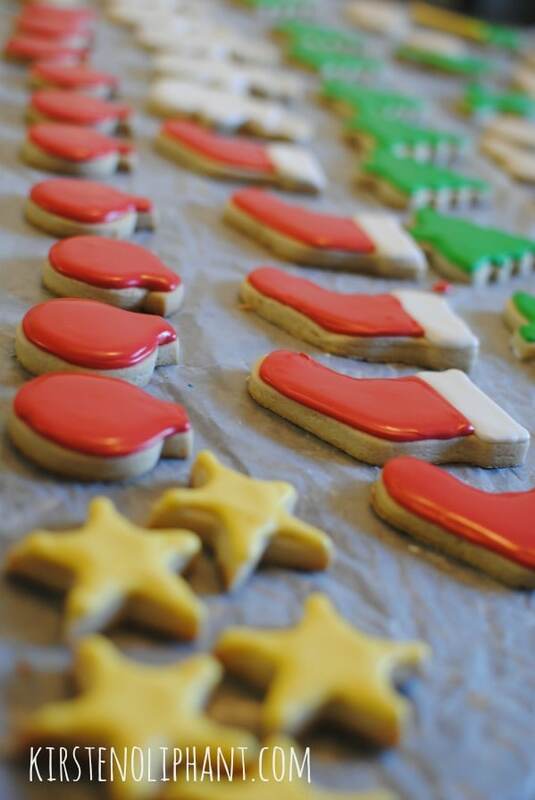 -If you are using more than one color per cookie, do one at a time and make sure that piped edge dries fully so you don’t have icky running of the colors. If you want to have a softer edge and be more decorative, you can use a toothpick to swirl two wet colors together as seen HERE. 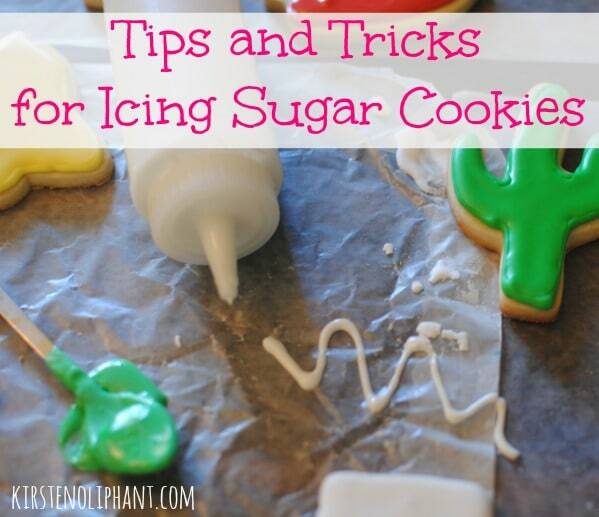 What are your tips and tricks for sugar cookies? Or do you have questions? Leave a comment or email me!